This is the second of two posts dedicated to the Fred MacMurray Blogathon being held over at Phyllis Loves Classic Movies. Tnx Phyl for letting me take part! Brief Synopsis – A brilliant scientist who is constantly seeking ways to improve the world accidentally creates a new energy source which causes many problems when a local businessman tries to get a hold of it. My Take on it – This is a film that I have heard about for decades yet never really had the inclination to watch. When I joined Phyl’s blogathon about all things Fred, I came across this title and decided that this was an opportune time to finally see what it was all about. I’ve seen the Robin Williams remake known as Flubber (1997), yet didn’t like it very much and therefore secretly hoped that the original would be much better. Fortunately fr me it is. The idea presented here is quite interesting and remains fun throughout which helps keep things enjoyable. MacMurray in the lea dis a great choice and he manages to play the dramatic, humorous and even romantic aspects of this film quite well. He is helped by a great supporting cast who help keep this story and its plot moving along at a great pace throughout. They do a wonderful job showing the various uses for this new invention and given the fact that this was made in the early 1960’s, they manage to keep the special effects seem quite realistic. The plot itself may be slightly far fetched, yet despite this fact, they are able to make this story work quite well and stay interesting from start to finish. Bottom Line – Interesting and fun idea that works quite well. MacMurray is great in the lead and is helped by a very talented supporting cast. The many uses for this new invention are shown really well and given the time frame of when this film was made, the special effects are done quite well. The plot may be a bit far fetched yet it still works despite that. Recommended! 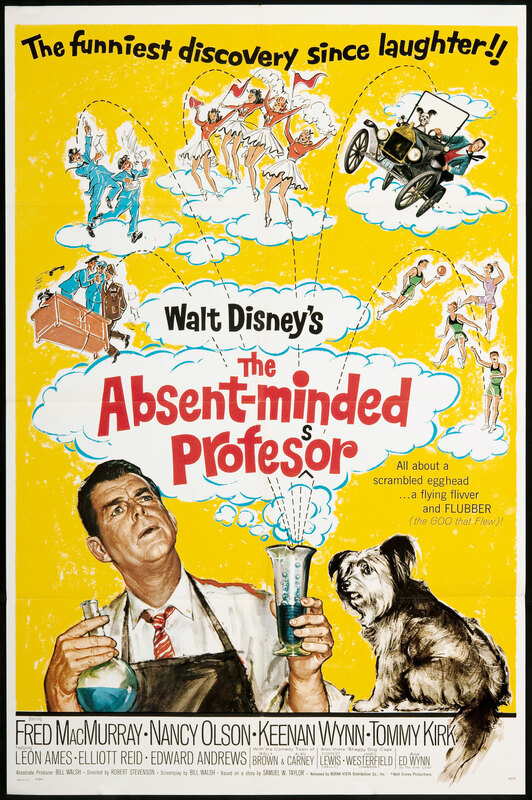 The Absent-Minded Professor is one of my all-time favourite MacMurray performances. He plays Ned Brainard completely straight and it is perfect comedy. You really believe that he believes he invented flubber, the greatest thing in the world. I love Fred MacMurray in this film. I totally believe he is the absent-minded professor!